Gourmet Body Treats is a small family owned business that began for very personal reasons. Waleska, the creator of all our formulas had severe rosacea and hyper sensitive skin that was not helped by numerous trips to the Dermatologist. She began her personal quest to find products that would help her irritated blemished skin, but when she was unable to find any she started making her own. She started in her kitchen with an idea for soap. Soon family and friends began asking to buy her soap for themselves and their children. A decade later Gourmet Body Treats continues to hand make all products from start to finish in hopes of helping others feel better about themselves while helping preserve the planet. These natural products are truly a treat. 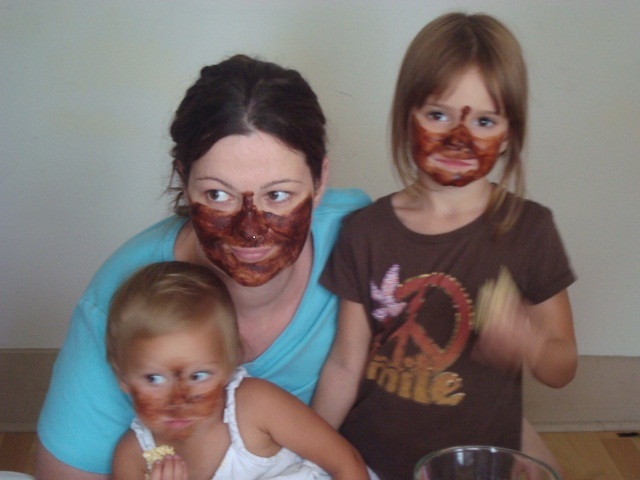 As you can see above, my nieces and I are all decked out in our natural chocolate facial mask. The smell was so wonderful I worried little tongues might want to taste. So I checked the ingredients and that was fine - everything contained in the mask was safe to eat. I love that. And I was right the girls did get a taste! Our skin was nice and fresh afterwards and although the girls' skin is always bright and glowing, it left my skin exactly that and feeling taut. I really enjoyed the treatment and I really think the scent while it was drying was a mood lifter as well! I also got to try the Gourmet Lip Gloss and Loose Mineral Eye Shadow. I LOVE the lip gloss. I'm picky about my lip gloss - it has to feel right and this was perfect with a nice natural color. I don't wear much eye shadow either, yet a light dusting of this mineral shadow perfectly offset my eyes. The best part about Gourmet Body Treats products is that their products are health and environmentally conscious. All of our products are 100% vegan and manufactured on site fresh daily from our hands to yours. We never use any ingredients that contain or sourced from animals or insects such as honey, lanolin, carmine, ect. We constantly strive to produce high quality products that are ethically made and 100% natural. We source all of our ingredients from locally farmed and organic sources when ever possible. We spare no expense when deciding what ingredients to use for all of our products. All ingredients are tested for purity, we make sure nothing like pesticides or fragrances are in the raw ingredients we use. In an effort to protect our environment we package our products in glass or recyclable plastic containers whenever possible and constantly try to find better more eco friendly containers. We NEVER test our products on animals and insure that all of our raw ingredients have never been tested on animals either. We test our wonderful products on family and friends. Products you can feel good about spending your money on and using on your skin. My favorite kind! One very lucky winner will receive a $50 gift certificate to Gourmet Body Treats!!! *Follow me @jamaise at Twitter & Tweet this : RT @jamaise #GIVEAWAY #WIN - a $50 gift certificate to Gourmet Body Treats - cosmetics, hair & skin care http://bit.ly/c3k7gM ends 8/4 tweet each day for one entry each ! That's 11 entry methods with tons of bonus & a chance for unlimited entries with daily tweets! Disclaimer: Gourmet Body Treats provided me with a free sample of this product to review, and I was under no obligation to review it if I so chose. Nor was I under any obligation to write a positive review or sponsor a product giveaway in return for the free product. These views are my own. I am a brand new follower here! I would love to try some of the face products! Healing Lavender Soap would be one of the things I would get! I just love fancy soap,don't you! I am following and I love the Vitamin C face mask looks Great! I liked Gourmet Body Treats on FB! I'm M. V.B. I follow and I want the Lemon Mint cleanser! I would buy some Loose Mineral Eye Shadows! The pictures show up as redX's right now though. =[ I wish I could see the colors. Anyways, added you via Google Friend Connect! I'm a fan of Gourmet Body Treats on Facebook! Posted this giveaway on GBT wall! Following you via Google Friend Connect! 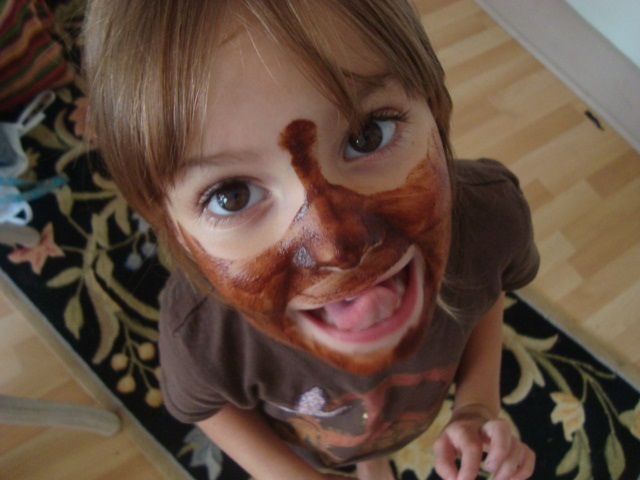 i would love to get their Neem soap, Vanilla Mint Shampoo, and Chocolate Butter Cream Scrub, and am a friend at Wishing Penny via Google Friend Connect -- thank you for the chance! i entered the Sport Brella giveaway! i entered the Hello Mellow giveaway! i entered the Jim's Organic Coffee Gift Basket GIVEAWAY! Grabbed your button and put it in my blog post! i would love the vanilla mint shampoo because i love all things vanilla! I would buy Cucumber Facial Mask. 1. I follow on GFC. 2. I follow on GFC. 3. I follow on GFC. Also, I am publicly following your blog on Google Friend Connect (username Nelsby). Entry #1 --> I *Like* Gourmet Body Treats on Facebook (Aimee Waerhouse). Entry #2 --> I *Like* Gourmet Body Treats on Facebook (Aimee Waerhouse). Entry #1 --> I am following Gourmet Body Treats on Twitter (@Nelsby). Entry #2 --> I am following Gourmet Body Treats on Twitter (@Nelsby). Entry #1 --> I follow you on Facebook via Networked Blogs (Aimee Waerhouse). Entry #2 --> I follow you on Facebook via Networked Blogs (Aimee Waerhouse). Entry #1 --> I am following your blog on Google Friend Connect (username Nelsby). Entry #2 --> I am following your blog on Google Friend Connect (username Nelsby). Entry #3 --> I am following your blog on Google Friend Connect (username Nelsby). 1. I entered Thomas & Friends ~ Creaky Cranky GIVEAWAY. 2. I entered Thomas & Friends ~ Creaky Cranky GIVEAWAY. 3. I entered Thomas & Friends ~ Creaky Cranky GIVEAWAY. Coffee and brown sugar scrub sounds good. I would buy the vitamin C face mask — all natural! I would get some of the Herbal makeup remover. I entered the Sport Brella giveaway. I entered the The Wishing Elephant giveaway. I entered the Jim's Organic Coffee giveaway. I entered the "Of Bees and Mist" giveaway. I entered the Happy Heiny's giveaway. I entered the The Baby Bunch giveaway. I entered the Simply Organic giveaway. I entered the ToiletTree giveaway. I entered the Tropical Traditions giveaway. I entered the Barney giveaway. I entered the Nutraluxe MD giveaway. I entered Nutraluxe MD ~ Nutra Sonic Face Brush System Professional giveaway. I entered Hello Mellow Body Butter. I entered Of Bees and Mist ~ By Erick Setiawan. I would love to try the Vitamin C Facial Mask. I have so much oil production on my face...I can feel it producing. I know! I would get the organic baby wash and the bum salve - love all natural products for my son.I am a follower via GFC. I love the Gourmet Nail Polish.